At Blue Compass, we can build an exceptional website for your online visitors to enjoy. But did you know that we can also build a collaborative company intranet or extranet software for your team? From documents and announcements to Learning Management System enhancements, our custom intranet software is tailored to your company's unique set of needs and requirements during the intranet design and development process. When you think of some of the most important features of intranet software, security tends to be near the top of the list for everyone. That’s why we take no shortcuts in providing a completely secure environment. Whether you opt for a true company intranet (only accessible while on your company’s internal network), or an extranet, (accessible from any web-connected device with internet access), we use role-based security with all sensitive information encrypted. We also include a password strength tool that encourages users of your company intranet to have strong passwords - using weak passwords is a security risk of massive proportions on the web today, and we help avoid that right out of the gate. Profile management is a native feature of our software, so your users will be able to manage their passwords and security questions right from their profile within the intranet - no administration assistance or oversight necessary. Users can even keep other personal information, such as cell phone number, preferred name, and more up to date through the profile system. Within Blue Compass’ custom built intranet software, everything from your intranet dashboard content, documents, external links and LMS training events, to news articles and alerts can be made visible by department to only those who should have access. It’s as easy as assigning your desired audience to a blog post, dashboard alert, callout, document or training event upon creation - then, that item will only be visible to the appropriate set of users when they access the company intranet. It couldn’t be easier. What company doesn’t have a need for centralized document access? None, by our last count! There’s so much benefit to be found in moving document and file storage off of individual computers, USB flash drives, external hard drives and temperamental network drives onto a centralized company intranet. Even stand-alone cloud storage has its downfalls with limited storage, expensive monthly costs, add-ons and the risk of file corruption or loss of access. With our competitively priced storage allotments that can adjust to meet your needs, you never find yourself forced to buy a heap of storage you aren’t going to use for years, if ever - we can get you the space you need at a price that makes sense. When you consider all the pros and cons, one thing becomes abundantly clear: no one has time to deal with all the headaches associated with keeping files handy, but out of the way. With our intranet’s dedicated Documents and Files area, you’ll find all the tools and functionality you need. All file types, outside of executable files (.exe files) to maintain the highest levels of security, can be stored within the Documents and Files area, so you’ll be able to make your intranet software the primary depot for all of your company’s files. From videos to spreadsheets - one centralized location for everything will have your staff streamlined and will make sharing easier than ever. Add to this the fact that our audience permission system is present in the Documents and Files area, allowing only the people you choose to see the files you upload, and you’ll soon realize you’ve found the one-size-fits-all intranet software you’ve been searching for too long. In today’s digital world, having a recognizable brand image is more vital than ever. Being able to seamlessly transition your clients from print to digital media with cohesive branding language is known to garner increased loyalty and sales, and the same is true of employees. When an employee buys into the image of the company, they are proven to perform more efficiently, more proudly proclaim their allegiance to the company, and bring on board their qualified friends and contacts – both as clients and employees. 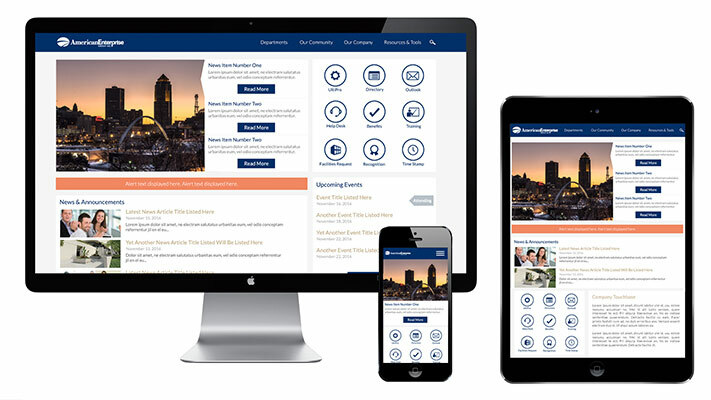 So when the time comes to bring your company into the modern era of employee portals, let Blue Compass prepare a company intranet design that perfectly matches your brand and style. 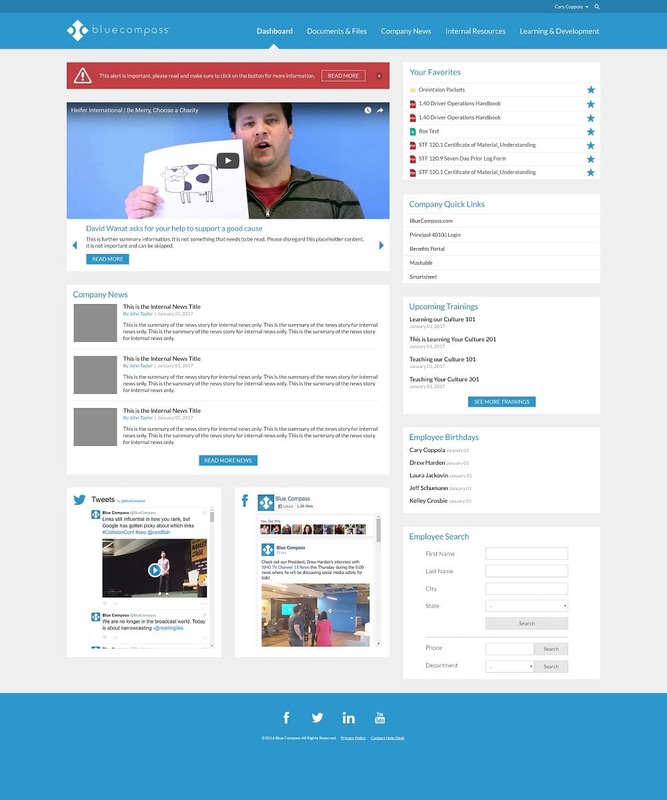 We employ the latest techniques and design tools to prepare a truly specialized and custom look and feel for every website we create - your intranet dashboard will be no different. 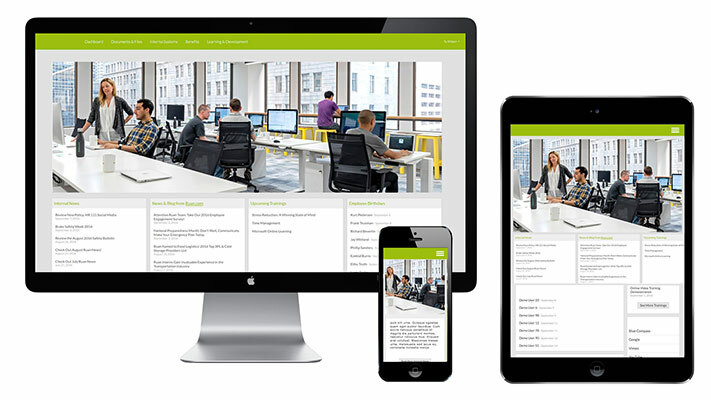 Let us show you how broad our intranet design abilities can be, from completely cutting edge and modern, to classically professional. We live in a time when a quick and efficient search is an expected and widely utilized tool. There’s even a new verb for the act of searching: “Googling,” which has become the most common way to say you’re performing a digital search. We wouldn’t dream of providing intranet development as a service without this popular tool. Employee Search gives you the ability to search your company intranet by name, city, state, phone or other customizable data points to suit your needs. You can even take it one step further: never forget your co-workers birthdays and anniversaries with a homepage callout of upcoming dates to remember! There is also a powerful document search that allows you to search not only the title of documents but also keywords that can be added to documents, files, folders and links. So the next time you’re looking for that hard-to-find 401(k) application form, you can search “retirement” and instantly find the document without having to request it from your HR manager. 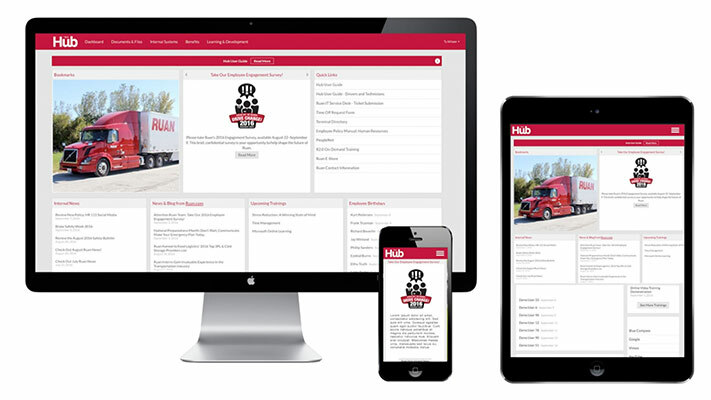 With our Basic Content Pages functionality, you’re able to create whole “mini-sites” within your company intranet where you can produce pages of content in a typical page structure. If you’ve used a CMS to produce pages and content before, our Basic Content Pages interface will feel very familiar. If not, it won’t take but a few minutes to get the hang of creating whole sections of a site. These pages allow you to house things like a benefits site or an FAQ section, or even a list of photo gallery pages - the sky’s the limit - all in a way that feels just like a page on a traditional website. Another perk is the ability to set permissions for various mini-sites so, again, you can share only what you want, with who you want. The potential is very deep with Blue Compass’ Basic Content Pages. When you visit your company intranet, you will land on the intranet dashboard. The dashboard is completely customizable, with the flexibility to switch out information as new updates become available, so you can easily share the most important company news with your employees. The intranet dashboard includes a number of customizable elements including a callout section for rotating images or videos, a quick links section to display your company’s most important links and an internal news area. Plus, with the alert system that is built into our intranet software, you can share timely happenings with the whole team. There’s no denying that the influx of mobile devices has taken the world by storm, and digital content producers and developers were scrambling to make sure consumers would have a good experience on any device. Not the case at Blue Compass - we’ve been producing nothing but mobile friendly, responsive sites for several years now and our intranet development process is no different. Whether you’re on a smartphone, tablet, laptop or desktop, your intranet dashboard is responsive with every bit of functionality maintained between the various operating systems, device manufacturers and screen sizes. Nothing will slow down your ability to collaborate and get work done! When you choose us as your hosting partner, we will host your intranet on a Microsoft infrastructure stack running industry-standard methodology. Redundancies are built-in to ensure the highest levels of uptime and data integrity. Edge firewalls allow only necessary web traffic to sites and monitoring ensures proactive alerts are generated. The web frontend includes load-balanced Windows Servers running IIS while backend databases are housed on failover clusters for maximum availability. Backup and disaster recovery plans are implemented and change control procedures are practiced by development as well as systems administration teams. Security patch schedules are rolled out monthly. DDoS contingency procedures are in place to respond to an attack situation and incident response plans are also published internally. Let Your Intranet Work For You! So what are you waiting for? 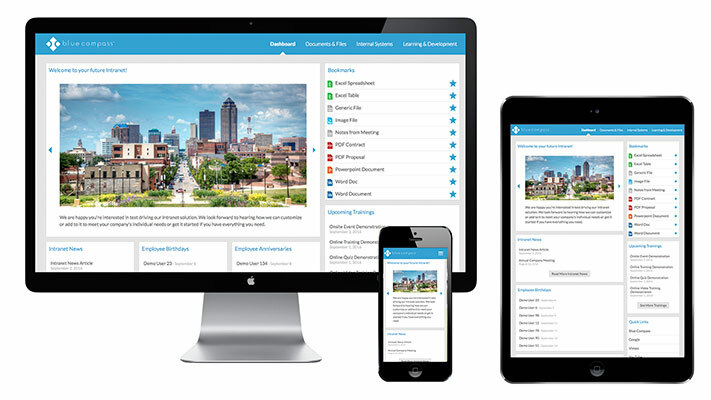 Get the best intranet development in Des Moines by reaching out to Blue Compass today to inquire as to how we can provide a custom intranet or extranet solution for your company’s needs.